Winners – Michael Ellison, Jacob knight, Harry Porter, Bradley Foley and Tanaka Madzvamutse. 80 Barton Peveril Sixth Form College students competed in the first stage of the National Skills Challenge. The first stage, held at the College, saw students work in teams of five to create a pitch for a new University Campus of Football Business (UCFB) development in Asia. The National Skills Challenge is a real-life business Challenge run in association with NatWest and UCFB, which aims to develop employability skills required for the world of work, including teamwork, communication and leadership. 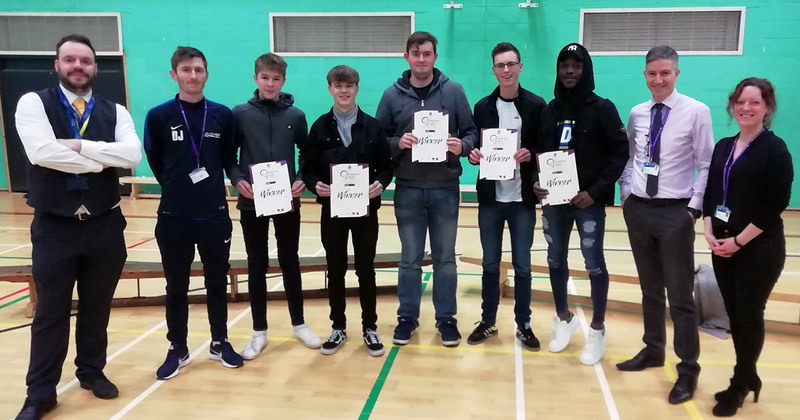 The winning team were former Wildern School pupils Michael Ellison and Jacob knight, former St George Catholic College pupil Harry Porter, previous Wyvern College pupil Bradley Foley and Crestwood Community School’s former pupil Tanaka Madzvamutse. The first stage’s winning team have now been put forward to compete against the best teams from 77 other colleges from around the country, whose students also competed at their colleges in this first stage, at the national finals in London this April. The overall winners of the national finals will win a paid internship with NatWest and will see their idea turned into the new UCFB campus in Asia.